It hasn’t been a great year for cruise ships. We had that one last month that stalled off Mexico, forcing passengers to have a less-than-luxurious cruise before the ship was towed back to San Diego. 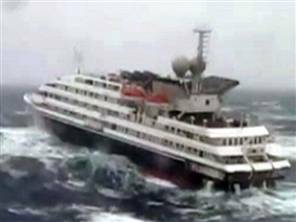 The disabled cruise ship is shown bouncing around in the waves off Antarctica. At least it turns out that reports those passengers had to eat Spam are probably false. Even if anybody could eat on this ship without tossing their cookies, can you imagine just trying to catch the food as it races by, back and forth as the boat pitches in the waves. After watching the video, I think I’ll endure a Vermont winter and forget about notions of a Caribbean cruise, thank you very much. This entry was posted on December 9, 2010 at 11:51 am and is filed under Uncategorized. You can follow any responses to this entry through the RSS 2.0 feed. You can leave a response, or trackback from your own site. I was very fortunate to sail to Antarctica in the southern summer of 2003/4 on the Royal Princess, since scrapped and replaced by an ugly modern pretender. Even at 44 000 tonnes, we had to endure a force 9 gale near the South Georgias which kept the adrenaline flowing for an exhilarating 6 hours. Even worse in conditions such as this, are the small bergs called growlers. About the size of a small sub-compact, they would be unseen in these weather conditions and could cause considerable damage to 0.75cm marine steel. Icebreakers hulls carry a punch backed by 4.5cm marine steel. Permits for ships to travel below 60 deg S are becoming increasingly difficult to obtain, for good reason it seems. They were lucky to have made it out safely.